Join Austin Monthly magazine at NEST Modern for a night of vintage bites and classic cocktails inspired by the 1950s featuring Austin Monthly Magazine's Best New Restaurants. 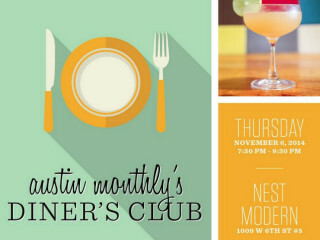 Guests of the Diner's Club will have a unique opportunity to savor delicious creations by over a dozen of the area's top chefs and craft bartenders while enjoying the progressive yet iconoclastic designs of NEST Modern and 1950s-inspired tunes by DJ Hexum. Proceeds from the Diner's Club benefits will go to the Austin Food and Wine Alliance.